I like to think, some would even say I overthink. Like everyone else my thoughts are sometimes dark, sometimes on the daft side and sometimes just random. I like random thoughts, they often come unbidden and keep me occupied for seconds. They are often prompted by people-watching. I won’t believe anyone who says they don’t people-watch, we all do that. Travelling gives you people-watching options by the bucket-load. Strangers and scraps of passing conversation will always give you plenty to mull and invent. Perhaps it is a female thing but do you ever invent personas for people you see in passing? As I sit in airports when I travel I see families and couples. Children are a great source for my imaginings. I see the elder sister ‘herding’ her younger siblings and the style employed will have me pondering her future career. The child who smiles and persuades, perhaps she will be a teacher or psychologist? The child who orders and lines up the siblings, perhaps she will take a supervisory postition? Then there is the child who does both, persuades but ensures that everything is orderly, perhaps a Manager in the making? I have other thoughts too. There are things I see that are normal to most but bring out my more bonkers side. When driving about and I see a jogger, particularly one who looks a bit tired, don’t you get the urge to stop and offer them a lift? This may be influenced by my convinction that jogging just isn’t natural but I am always tempted to stop and say ‘Have a wee rest love, you need to catch your breath’. Then there are supermarkets. For a woman who loves cooking as much as I do, wouldn’t you think that the process of picking the raw ingredients would be something I love to do? I watch cooking programmes, you see the chefs looking through the ‘produce’ and extolling the virtues of the green and leafy ingredients, waxing lyrical about the taste and endless possibilities. Ha! I hate shopping. I get around the supermarket as quickly as I can. I don’t throw items in at random, I have a list in my head but I always go in with that secret wish to break the land speed record with a trolley. I shopped tonight, spending more money than I see as reasonable to get one trolley of food to keep my family for a week ( just don’t start me on the prices). As I left, I met a woman going in. She looked as cheerful as I had been going in. It was all I could do to stop myself saying ‘Don’t do it, it is hell in there!’. I wonder if this is normal behaviour for a grown-up or is it just me? Please tell me that I am not the only one who feels like this? When I mention this to friends they ask me why I don’t shop online. Don’t start me. Just because I can sit on my sofa while shopping is no compensation for having to trawl through online lists that take forever to refresh. Then you can’t find the one thing you are looking for on the online selection, hmph! It takes longer for me to do a shop online that it does to traipse through the supermarket so no, I don’t do online grocery shopping. If someone can tell me how to make it not a chore then perhaps I will try again but until then. My last musing for tonight? There are two reasons you have children, at least that is what I tell mine. They have a couple of useful functions. 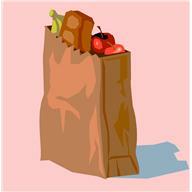 When I come back from the dreaded supermarket I have had my fill of bags and tins and vegetables and meat. All I want to do is sit down, kick my shoes off and have a cup of tea. So, when I arrive home from the supermarket, I walk in the door, sit down and demand tea. Strangely enough, this is one of the few times when my children kick into action without any nagging. The bags are taken in, unpacked and, with only a few queries about what goes where, everything is put away and a cup of tea miraculously appears by my side. Just goes to prove that Lesley’s random thoughts (and demands) sometimes succeed. Bliss……..